This form is used by an agent when entering into the employment of the holder of a trust deed note to act as their sole agent for a fixed period of time, to locate a trust deed investor and arrange a sale and assignment of the note and trust deed. making a loan evidenced by a note in favor of the investor and collaterally secured by an existing note and trust deed held by the borrower. A loan collaterally secured by an existing trust deed note is indirectly secured by real estate. This is a transaction a real estate broker or agent may arrange for a fee. If the collateralized loan becomes delinquent, the lender repossesses the trust deed note pledged to secure repayment, not the underlying real estate. Here, the pledged trust deed note secured by the real estate is not in default. On repossession of the trust deed note due to a delinquency in the collateralized loan it secures, the lender becomes the holder and owner of the trust deed note repossessed to satisfy the collateralized loan. Consider a carryback seller who holds a note and trust deed received on their installment sale of a property. The carryback seller wants to retain ownership of the note (as opposed to selling it to obtain funds). Thus, to borrow money, the holder of a trust deed note temporarily assigns the note and trust deed to a lender as collateral pledged to secure the loan, a process called hypothecation. On a default in the collateralized loan, the lender repossesses the trust deed note which is the security for the loan. However, the lender does not foreclose on the underlying real estate which is security for the repossessed trust deed note. Whether an investor purchases a trust deed note or makes a loan collateralized by a trust deed note, the trust deed broker and investor need to consider the due diligence investigation and documentation needed for the purchase or hypothecation of a trust deed note. the ownership of the note and trust deed. Trust deed note holders, particularly carryback sellers, often decide to sell their trust deed note. 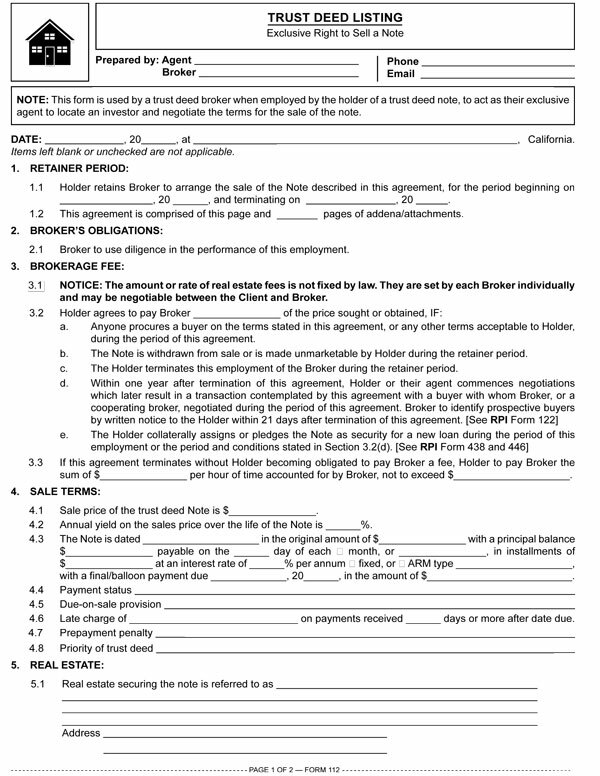 The task of their trust deed broker is to cash-out the holder of the trust deed note by locating an investor to purchase the note. The listing agreement obligates the trust deed holder as a client to pay the broker an agreed-to fee when the broker fully performs by meeting the objective of the employment — locating an investor who acquires the note and trust deed. The Trust Deed Listing – Exclusive Right to Sell a Note calls for the note holder’s disclosure of all material facts regarding the assignment of a trust deed note to an investor — facts the broker is duty bound to disclose to an investor on commencement of negotiations to acquire the trust deed note. Form updated 02-2016 to include the Form Description at the top, white header/footer convention and RPI branding. This provision protects the broker’s fee by barring the holder of the trust deed note from borrowing against it rather than selling it in an effort to beat the broker out of a fee. Form navigation page published 03-2016.